London has Covent Garden, Venice has the Piazza San Marco, and in the heart of Amsterdam lies Dam Square, a vibrant and colourful meeting place, where residents and visitors alike gather to experience the sights and sounds of the city’s culture and ambience. Overlooked by the Royal Palace, which can be found next to Madame Tussauds wax museum, and surrounded by cafes, bars and restaurants, the square is the perfect place to sit and enjoy the many live music bands which play throughout the day and well into the evening. The Dam hosts funfairs, carnivals and festivals throughout the year, but on a daily basis, there is always something happening in the Square. Street entertainers, theatrical performers, buskers and bands, bring The Dam to life with performances that you can enjoy from the comfort of your outdoor café seat. Every day you can hear the strains of string quartets, jazz bands, pop tribute groups, folk and swing, floating across this popular and busy landscape. It is the perfect introduction to Amsterdam’s culturally rich and diverse society and any visitor to the city, would be wise to start their experience here. Originally built in the 17th Century in the neo-classical style, as a town hall, the building was later to become the royal palace of King Louis Napoleon. It can be found next to Madame Tussauds wax museum and opposite the War Memorial. Built by Jacob van Campen in 1684, it was formed from sandstone and decorated throughout with a marble interior. The central hall inside the building, is vast at nearly 120 feet long and 90 feet high. The Palace is the perfect venue for art works to be displayed and you will find paintings by the likes of Ferdinand Bol and Jan Lievens as you explore the vast and opulent rooms. Today the Palace is used by the Monarchy for official functions and award ceremonies, but is also open to the public and is an essential visit for anyone interested in European history and architecture. s, or were wounded, in World War 2. Designed by Dutch architect J.J.P. Oud with accompanying sculptures made by John Radecker, the monument takes the shape of a tall pillar, 72ft in height. 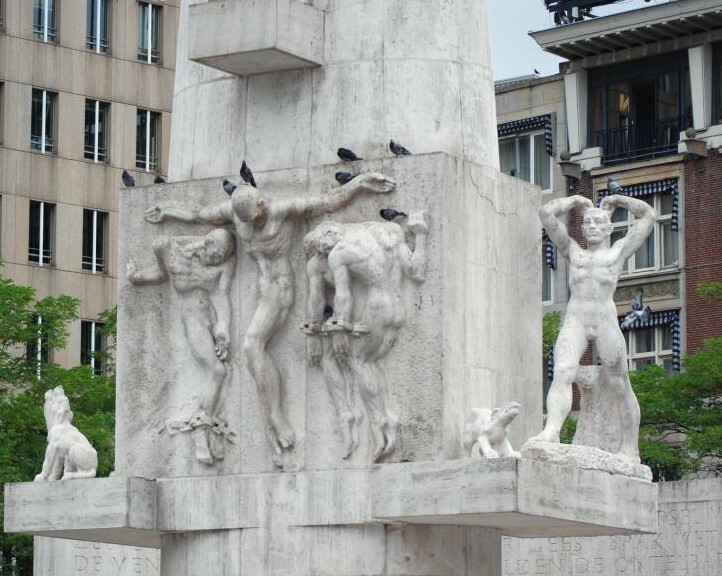 On either side of the pillar are two sculptures, representing members of the Dutch Resistance and various other statues can be found around the main structure, which all represent different aspects of the war effort. Behind the monument you will find a semi-circular wall, within which are urns containing soil from war cemeteries and execution grounds. The monument is a stunning example of how the Dutch celebrate and commemorate their past, and you may sit on the steps of the monument and watch the world go by, while you ponder the meaning of its presence. A 15th Century church, now used as an exhibition space and concert venue. A small café is adjacent to the church and you are welcome to wander around inside, visit the gift shop or, if you are lucky enough, attend a Royal Wedding! The church is also a burial site for many naval heroes and is a fascinating venue to explore and admire for its beauty and historical value.